Albright Fly Rod for a Barbie Fishing Pole. Last month, I took my wife and kids to the Snake River Cutthroats’, the local chapter of Trout Unlimited’s, Fly-Tying Expo in Idaho Falls. If you have never been, this is one of the best fly-fishing and tying expos in the nation. In the past, they have brought in such great fly-fishermen and tyers as Jack Dennis, Dave Whitlock, Bob Jacklin, Mike Lawson, etc. I encourage all to make the trip to this awesome annual event each April. Right after we walked through the doors of the Expo, I noticed a booth for the Teton Regional Land Trust, a conservation organization that I know very well, appreciate and support. The land trust is working to preserve some of the land and the natural resources that make Eastern Idaho so special. They do so through entering into conservation easements with private landowners. Many of the easements the Land Trust holds are along the riparian areas of the blue ribbon rivers and streams in the Greater Yellowstone Eco-system. I truly believe their efforts are preserving and protecting the great fishing that we enjoy in Southeastern Idaho. “Hi, Andy! Hey, I need you to do me a big favor. I have not sold even one membership while I have been here. If you will give me $20.00 right now, I will give your whole family a membership and put all of your names in for a drawing on this fly rod. What do you say?” asked Babette, as she pointed to a nice looking fly rod in a green case. “Sure, I think I can do that.” I replied while I reached into my pocket and gave Babette the last $20.00 in my wallet. What the heck, I knew it was for a good cause. As Babette put in the names of me, my wife, and my five children into the raffle, I admired the 9 foot 5/6 Weight GP Albright fly rod in and out of its case. Babette informed me that they would draw the raffle sometime the following week. Even with all my family’s names in the pot, I still felt it was a long shot for me to win, but here’s to hoping. “I did?” She asked with enthusiasm. Eden was very excited even though she did not know exactly what all this meant. I guess she just understood that if Dad was excited, she should be too. She also understood that this meant that she might get to go fishing with Dad, which she consistently asks for every time I go, “Can I go fishing with you, Dad?” Many times I have had to turn her down because of the dangers of some of the areas I fish. “Are you sure that’s what she wants to do?” I asked. “Yes. When we got off the phone, Eden asked if it was a Barbie fishing pole and I told her ‘No.’ She was bummed until I said, ‘I bet if you ask Dad, he will trade you for a Barbie fishing pole,’ and she said, ‘okay,'” Kristin explained. “Sure, I will trade a Barbie fishing pole for a fly rod any day!” I laughingly replied. And the deal was struck. That weekend, we found a short, pink and yellow Barbie kid’s fishing pole at Sportsman’s Warehouse for $9.99 and Eden, hugging it all the way up to the checkout, was as happy as can be. 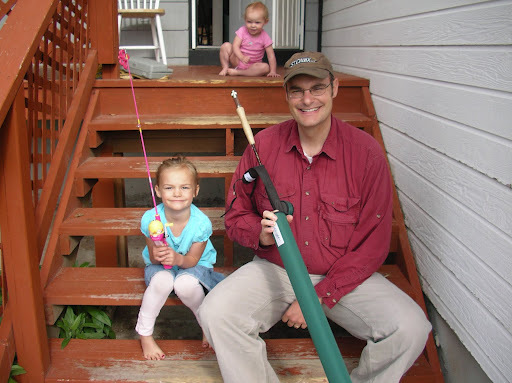 Of course, when I finally received the fly rod this week, so was I.
Eden with her Barbie fishing pole and me with my new Albright fly rod. Pretty good deal, if I do say so myself. To sum it up, I have to say that this was pretty much the best $30.00 I ever spent. Now I have no excuses. I need to take Eden fishing. I’ll let you know how it goes. Andy,that is by far one of the best win-win-win stories I've heard in quite awhile. Have a great time fishing with Eden and I look forward to reading about it. Cute story. Save your $$ though, she'll get even when she gets older. What a great story! You both look a little more than just pleased with the results.Congrats to both of you. AndyI'm way behind in my reading of the blog. What scoundrel you are! A Barbie Fishing Pole–you should have a least thrown in a Tootsie Pop! Great to have happy little kids and a happy dad at the same time.